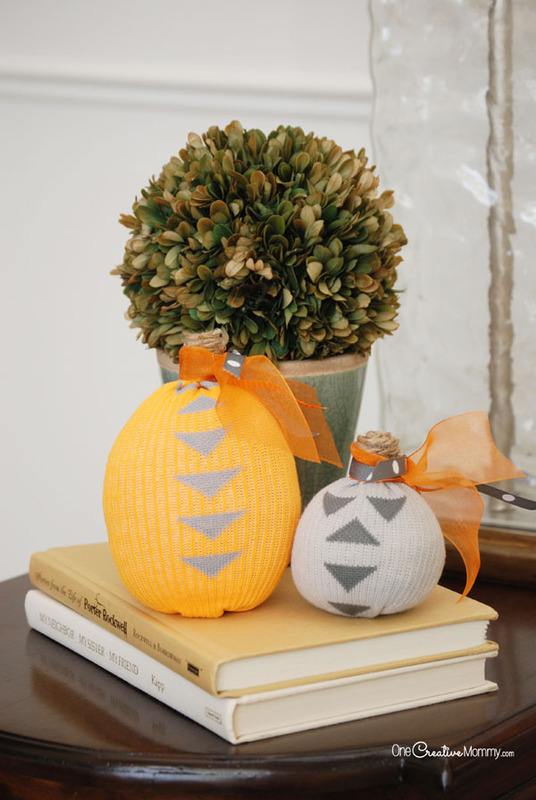 You are here: Home / Blog / Turn boring socks into cool pumpkin Halloween decorations! Have you ever noticed that inspiration comes from the strangest places? Mine came as I was browsing the sock aisle at Walmart! 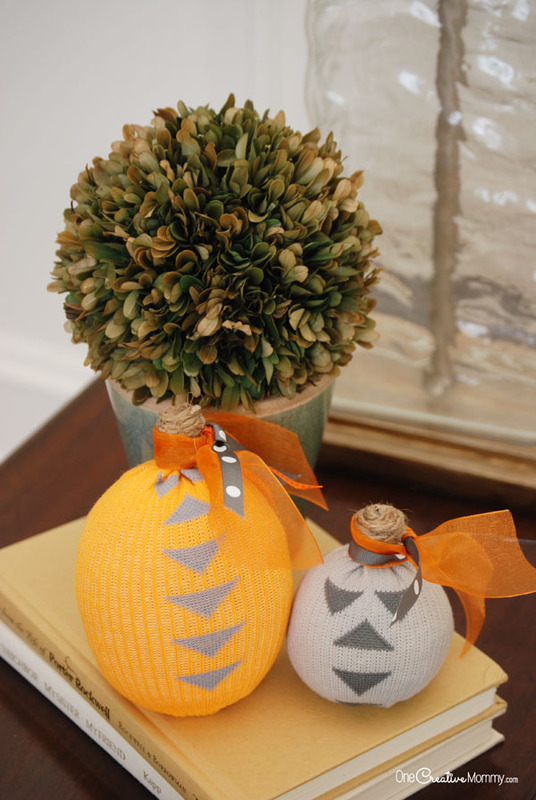 You won’t believe what these stunning Halloween decorations were before they became pumpkins. I guess the title of the image kind of gives it away! These pumpkins used to be socks. How fun is that? (Yes, I kind of have a thing for making stuff out of socks and rice.) Have you seen my Olaf Sock Snowman or my Easy Sock Snowmen Kids Craft? It worked for snowmen, so why not for pumpkins? I originally planned to make plain orange or cute striped pumpkins, but I couldn’t find the right socks. (Apparently, September is too early to find crazy Halloween socks. I thought stores put all of their Halloween stuff out in September, but I guess the socks haven’t made it to the stores yet. I’m kind of glad, because these socks (found in the boy’s section) were perfect! Ready to learn how to make your own? It’s super easy. Here we go! Socks! Any socks will do. Just choose a pattern or color that has the look you want. I think colorful horizontal stripes would be adorable. Choose some cute socks, or raid your drawers for lonely socks that have lost their match. 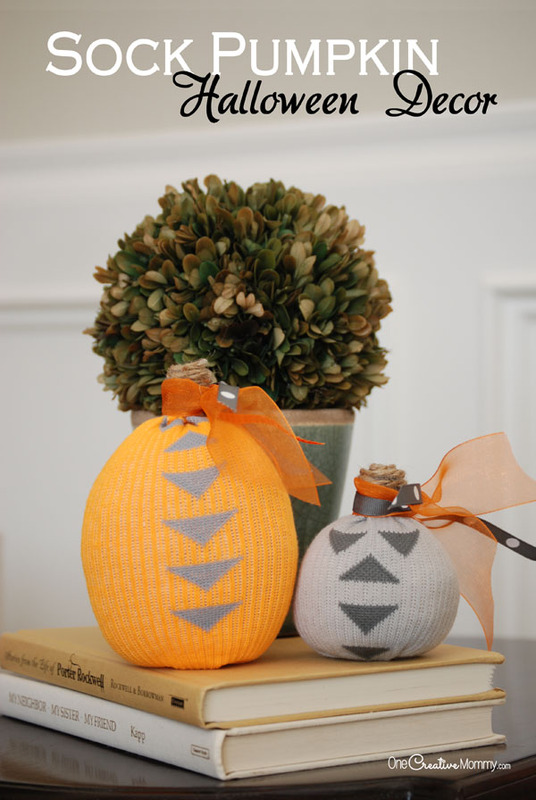 Decide which part of the sock design you want on your pumpkin, turn the sock inside out, and secure an elastic hair tie or small rubber band around the sock at the point that will be the bottom of the pumpkin. Cut off the part of the sock you don’t need, and turn the sock right-side out. Seal the top of the pumpkin with another elastic hair tie. Tie coordinating ribbon around the stem. Have a fantastic weekend! Happy Spooktastic September. 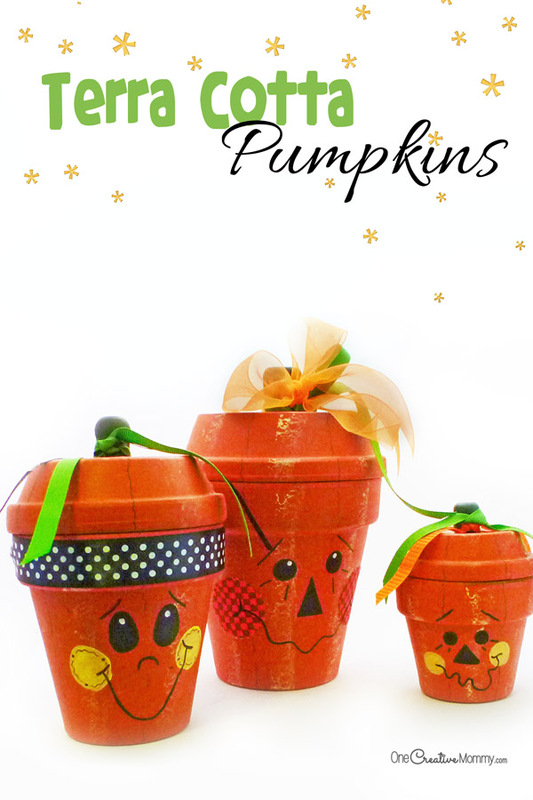 Be sure to check out more Halloween decorations ideas by clicking on the images below. OH MY goodness how cute!! !…and very clever – I haven’t seen the sock pumpkin before. 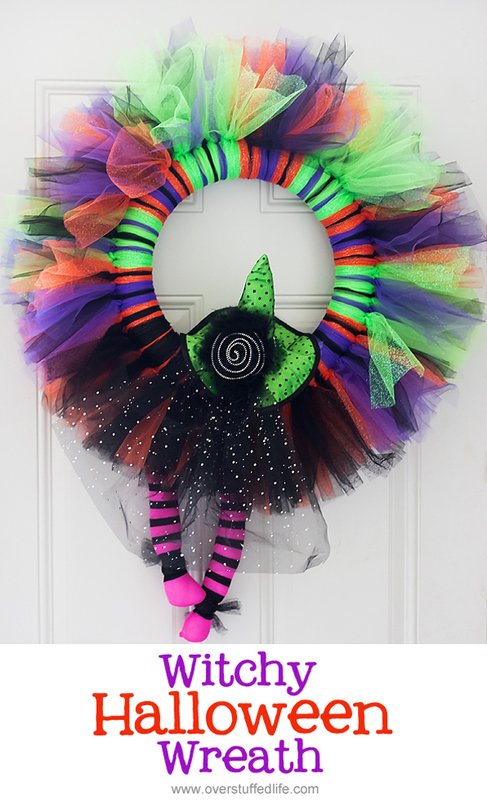 That witches wreath is also so cute. I’ve got lots of tulle, that I may just have to make her!! Thanks so much, Kim. I love making crafts out of socks. They make fun kids’ crafts. What a great idea! Simple and easy. I want to do this with the kids I watch. Thanks, Jacqui. You should for sure try it. It’s super easy. Those aren’t boring socks at all! I would wear those as-is! Ha–True. 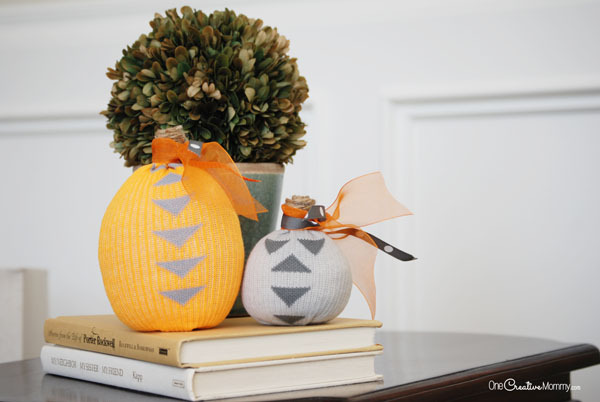 I guess those particular socks aren’t boring, but you could turn boring socks into pumpkins, too! Oh my goodness – such a clever idea! 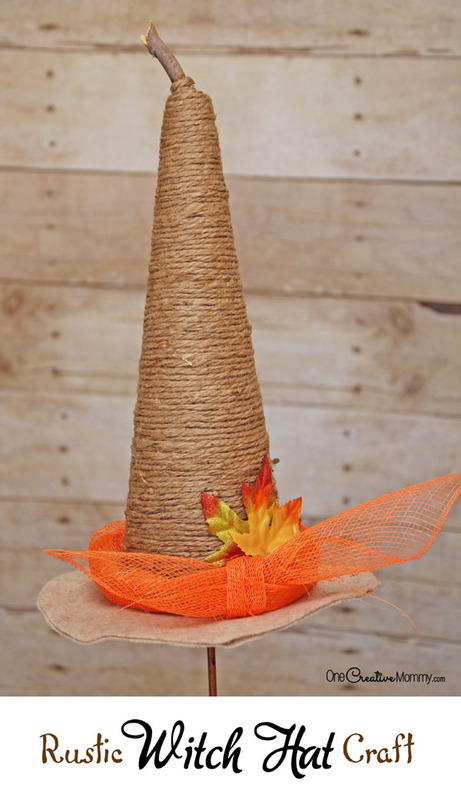 And I love the ideas underneath too like that witch’s hat! You are awesome!! You’re so sweet, Debra! Thank you! I love creating things for my home for the holidays. It’s even more fun when the kids can help. Well, that’s the most super cute craft ever. I always love crafts like this that take everyday objects and turn them into something adorable. Great job! Thanks, Jennifer! 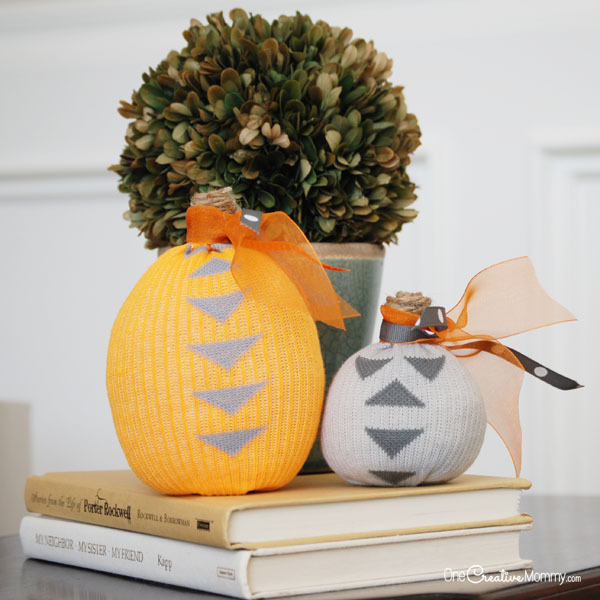 I love turning ordinary things into something fun for my home–especially socks. (It’s an obsession.) Have a great day! I saw this at the I Gotta Create link party. This is such a great idea! It’s a craft that is easy for kids to do — which is what I’m always on the lookout for! I’ve pinned it! Thanks so much, Nina! The kids had fun making things out of the scraps, too!